After a few days of steady southeasterly winds that kept us around Cape Edenshaw on the east side of our fishing grounds, QCL guests were happy to get over to the west side and try something different! This morning they were scattered everywhere! Quite a few moved offshore to pick up halibut and lingcod while many others focused on their favourite salmon fishing holes. 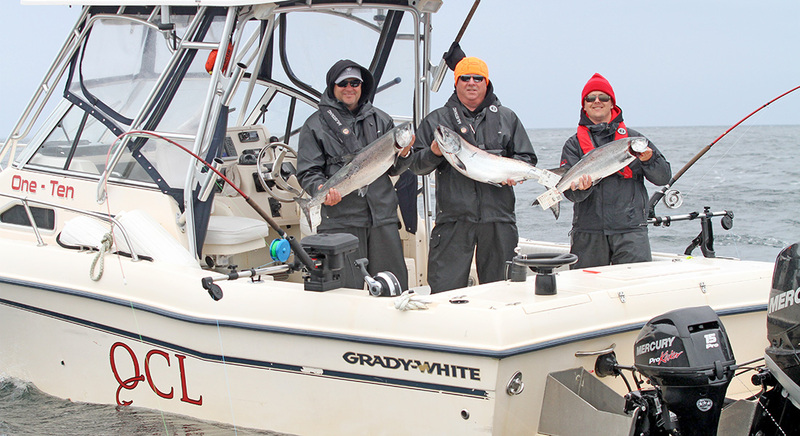 Salmon action has been most productive fishing a little offshore in 120-140 feet of water and running anchovies at 60-80 feet. While most of the salmon catch are those feisty early season feeders, we’ve seen the number of fish over 20 pounds increase steadily. Tyees aren’t common yet but it’s only a matter of time! If you’ve enjoyed catching Halibut before, you’ve probably caught some other scary looking fish from the bottom. One of these species is the Yelloweye Rockfish, sometimes incorrectly referred to as red snapper. When these fish are reeled up quickly from the bottom, their swim bladder expands and protrudes through their mouth. It kind of looks like a big tongue. Barotrauma is physical damage to body tissues caused by changes in air pressure and affects rockfish caught in deep water and brought to the surface. These old fish are declining in terms of population numbers and limits have been reduced this year. We are trying to preserve this species and help with conservation efforts. However, it is very difficult to release these fish and reverse the pressure effects. Each of our guides are now equipped with a descending device. A rockfish descending device is a tool intended to lower a fish back into the water at a slow rate in order for the swim bladder to decompress to a normal state. Our guides have already been able to test the devices and have seen great results. During your trip, you may be able to see the descending device in action and know that we are doing our part in conservation efforts for this species.